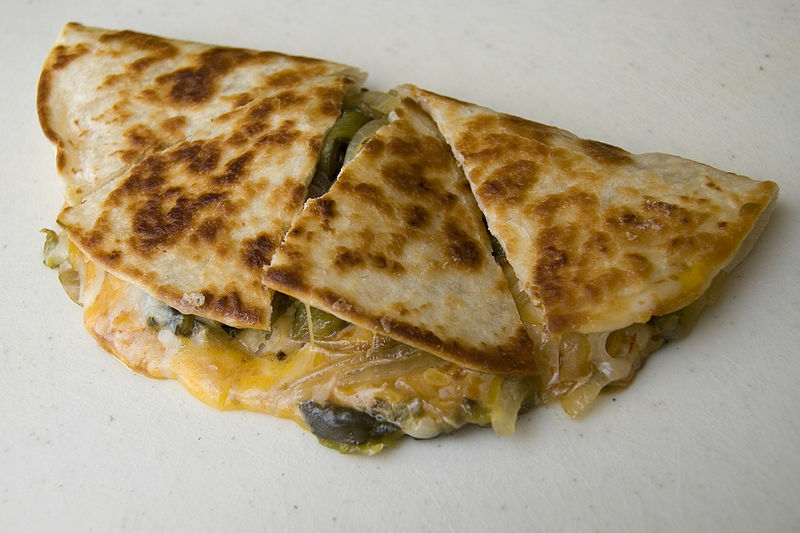 A quesadilla is a Mexican snack food made of cheese (and occasionally other ingredients) on a folded corn or wheat tortilla and cooked until the cheese melts. The word comes from Spanish, and literally means either "cheese tortilla" or "cheesecake". Left: A quesadilla, cut into wedges. While cheese is the most common filling, other ingredients are also used in traditional Mexican quesadillas. Fillings may include: pumpkin flower, beans, sausage, chicken, carne asada, ham, refried beans, maple syrup, sour cream, avocado or guacamole, potatoes, spinach, mushrooms, raw eggs, scrambled eggs, hamburger, yak, shrimp, bacon, etc. Salsas may also be added. Mexican quesadillas are cooked in a comal (a griddle or grill typically used in Mexican cooking), but quesadillas can also be deep fried in oil resulting in fried cheese tacos.